In class I incorrected stated that carbon monoxide (CO) binds to hemoglobin about 24000 times as strongly as oxygen. I was incorrect, and have included the correct information below. Below is a page from Lubert Stryer's textbook on Biochemistry (I have the fourth edition). Hemoglobin is the molecule that carries oxygen in blood, and heme, is the central portion of hemoglobin. It is possible to isolate heme, and it binds carbon monoxide 25000 (not 24000) times as strongly as oxygen. In blood, the heme is in hemoglobin. One important function of hemoglobin is that it shield heme from carbon monoxide, using a histidine group to prevent carbon monoxide from binding heme straight-on. This reduces the binding strength of carbon monoxide to just 200 times the binding strength of oxygen. 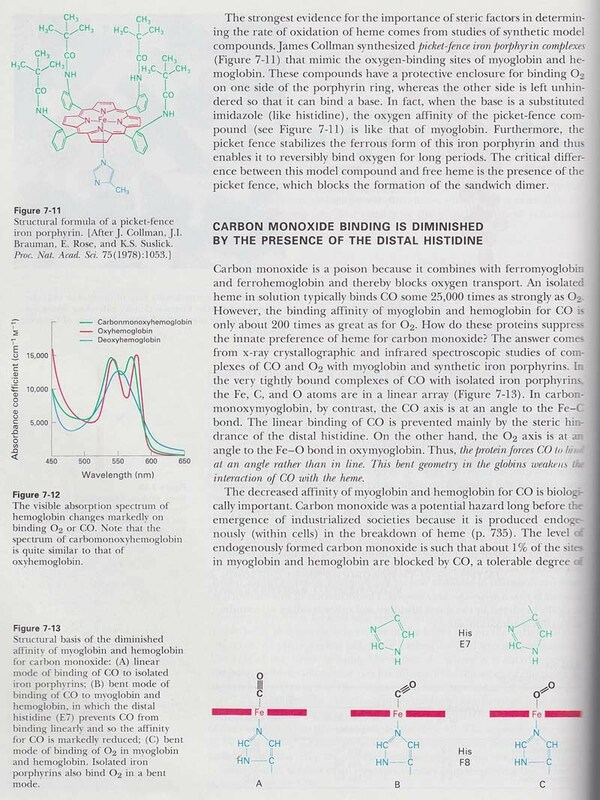 This page also show the spectra (color) of hemoglobin when it is empty (no oxygen), with oxygen bound, and with carbon monoxide bound. Your eyes can detect light over the same range as shown in Figure 7-12. When blood is nearly fully oxygenated, it looks more red. When blood is nearly fully deoxygenated, it looks more blue. This is largely because the absorption of 475 nm light is much lower in deoxygenated blood. This means more blue light will be seen, and the blood looks more blue. For more information, see http://en.wikipedia.org/wiki/Blood#Color. Sensitivity to color also changes based on the brightness of the scene you are looking at, because your eye will switch between using cones and rods for detection. Cones and rods have different color response.